Modesto City Hall is located at 1010 10th Street, Modesto, CA 95354; phone: 209-577-5200. 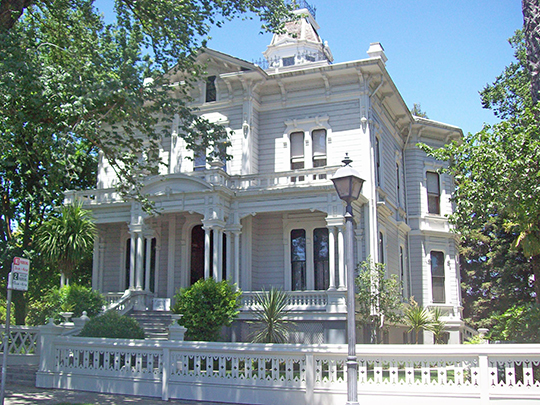 Photo: McHenry Mansion, ca. 1883, 906 15th Street, Modesto, CA. Listed on the National Register of Historic Places in 1978. Photographed by User:Valente Quintero Castro (own work), 2010, [cc-by-3.0 (creativecommons.org/licenses/by/3.0)], via Wikimedia Commons, accessed September, 2013. Why the Southern Pacific Railroad selected what would become Modesto as a townsite will never be known. Possibly the finding of a landowner in a good location willing to sell his land at a reasonable price as one reason. The railroad purchased 160 acres from John J. Atherton in April, 1870, the site of the original town. The Southern Pacific selected as the name of the town that of Ralston, in honor of William C. Ralston, president of the Bank of California, San Francisco. The name was printed upon the maps and it stated "that the name took well and pleased the people highly." Mr. Ralston, however, had not been consulted in the matter and through excessive modesty, it is said, refused to permit his name to be given to the new town, Because of this refusal the company changed the name to Modesto, a Spanish word, its English definition being "modesty." Soon the merchants of Paradise, Tuolumne City, Empire and Westport began moving their business, and nearly all of their buildings to Modesto. Sol Elias vividly described the event when he wrote: "When it became generally known where the new town was to be located, there was a general stampede from the three towns of Empire, Tuolumne and Paradise to the new site. For months the highways were thronged with buildings being moved to Modesto and it looked as through Tuolumne and Paradise were on wheels. It was indeed an odd site to see these two towns, furniture and people, traveling at a rapid rate to the first to locate in the railroad town." Many of the oldest wooden homes in Modesto were hauled from Paradise, while the brick buildings in those towns were torn down and rebuilt. An excursion party from Stockton, visiting the town in November of 1870, found 25 buildings located and being constructed. In 1871, J. D. Spencer coming from Paradise counted 75 buildings "many of which may be classed as imposing structures." Among these buildings, the first on the ground, was a little frame building, 18x24, owned by James McHenry and W.G. Ross. Modesto, seat of Stanislaus County, is on the banks of the Tuolumne River, here a muddy trickle because its waters have been impounded in the foothills behind 200-feet high Don Pedro Dam to provide waters for the Modesto and Turlock Irrigation Districts. Modesto was laid out by the Southern Pacific in 1870 after an older settlement nearby had bickered over concessions; the railroad company proposed naming it for W. C. Ralston, the San Francisco banker, but when he declined the honor some official turned a neat compliment to his modesty by bestowing the present name. The railroad company showed foresight in the town planning; the streets, crossing at right angles, run northeast, southwest, northwest and southeast to give the maximum of shade during the days of intense heat. Modesto has canneries, dairies, packing plants, and warehouses to care for the agricultural products of the prolific area for which it is a trade and shipping center. George H. Tinkham, History of Stanislaus County California with Biographical Sketches, Historic Record Company, Los Angeles, 1921.